Pennsylvania protestors are taking aim at one of President Barack Obama’s largest corporate supporters for not paying a "fair share" of taxes. On Sunday, a dozen protestors showed up outside the state capital building in Harrisburg, accusing Comcast and a slew of other major companies of failing to pay enough taxes. The demonstrators chanted "pay your fair share," in reference to the multi-billion dollar companies tax rate in the state. Ron Whitehorne, a retired Philadelphia teacher, told a local CBS affiliate that the Fortune 500 company should be forced to pay higher taxes in order to increase education spending in the state. "We think the policies are out of whack with what the people of our state need. It's the 1 percent getting everything and the 99 percent is hurting," Whitehorne said. "They should be paying their fair share … that is all we are asking. We are not saying don't make a profit. We're saying, ‘hey, let's put some back.'" Comcast is the parent company of MSNBC, the liberal cable news channel that has championed rhetoric favoring the "99 percent" in recent years. The telecom giant also has very close ties with the Obama administration. Comcast CEO Brian L. Roberts has golfed with President Obama and executive vice president David Cohen raised $2 million for Obama’s two presidential runs. Cohen has also visited the White House 14 times since 2010. The company has split its money more evenly in 2014 than it did in 2012, giving Democrats about $850,000 compared to $780,000 for GOP candidates, according to the Center for Responsive Politics. Pundits predict Republicans have a good chance of recapturing the Senate in November. The company is working hard to foster more relationships on Capitol Hill. Comcast is courting federal regulators and Washington political players to push through a merger with Time Warner that would give the company control of about 33 percent of the cable market. The company has spent $3 million on lobbyists so far in 2014 after spending nearly $20 million on Washington insiders in 2013, according to the Center for Responsive Politics. The left-leaning Citizens for Tax Justice, which is in favor of higher corporate taxes, estimates that the company has paid an average tax rate of 24 percent over the past five years. Comcast spokesman John Demming disputed the notion that the company did not pay enough taxes, highlighting that the Pennsylvania-based company paid the nearly $4 billion in taxes in 2013, including Pennsylvania taxes of nearly $350 million. Demming pointed out that the company has been a boon to the local and national economy, employing tens of thousands of employees in Pennsylvania and the country. 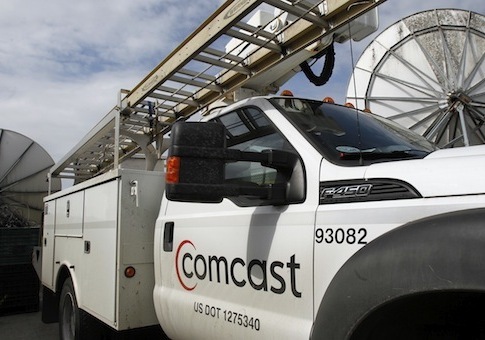 "Comcast is a significant taxpayer that benefits the state of Pennsylvania [and the country] through economic activity, improved employment, and contributing to charity," Demming said. "When you look at the numbers themselves, it’s clear that Comcast is a significant contributor."